This curse was enough to keep most people away from the island fr quite some time, but not everyone. In 1699, the legendary Scottish pirate Captain William Kidd stopped by these shores and supposedly offloaded a huge trove of stolen treasure here, supposedly cursing the treasure to bring misfortune and death upon anyone who would try to dig it up, before sailing off on his final voyage towards Boston, that would end up with him captured and finally executed for his numerous crimes. The third curse of the so-called “Thrice Cursed Island” was supposedly brought to the island in 1721, when a ragtag group of sailors stashed a treasure within the earth here that had purportedly once belonged to the great 16th century Mexican emperor Guatmozin, who had ominously cursed his treasure shortly before being tortured and killed by Spanish conquistadors in 1525. 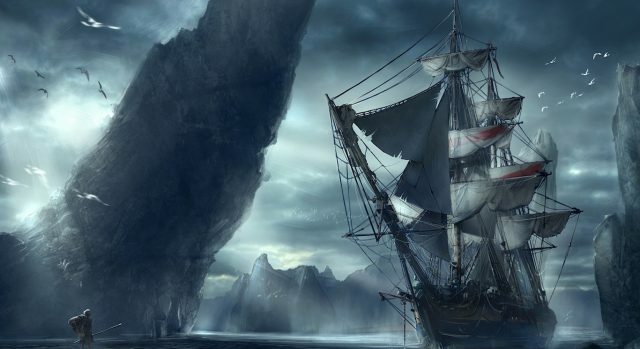 The sailors had apparently stumbled across the treasure hidden away in a cave in Mexico and stolen it, after which they been immediately beset by misery and woe. The curse would kill four of the five men who had discovered it, causing the sole survivor, fearful of when these dark forces would finally come for him, to dump it at Charles Island in a panic, along with its insidious curse. The tale of the cursed treasure of Folly Island has its origins in the Civil War as well, when a group of Union troops landed here to make final preparations for a push into Charleston. At some point they came across an old woman and a child, holdouts who had refused to evacuate in the face of the Civil Was tearing the area apart, even though all other residents were long gone. According to the tale, this woman told an officer named Yokum that she had seen pirates bury 6 chests of treasure between two oak trees right behind her own shack, and that they had then killed one of their own and tossed his body into the pit with it. This was tantalizing to say the least, but the woman warned that the treasure was buried by a pirate ghost that would let no one approach.